Our Commercial pressure washing company offers Professional Power Washing services to the entire Palm Beach Gardens area. Give us a Call Right now for a FREE pressure washing quote! Are you a business owner? If you are, there is a good chance you work out of a building that you either own or rent in the Palm Beach Garden, Palm Beach County or Southern area of Florida. We have a humid climate that can allow dirt, mold and algae to accumulate on buildings, making them less than pleasing to look at. 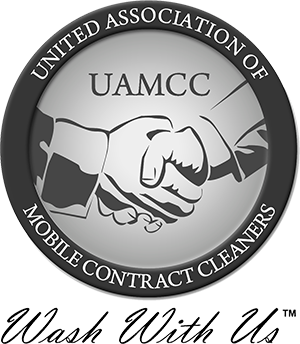 If you are looking to get your building, parking lot or more cleaned and you don’t want to have to attempt the job yourself, you’re probably looking for a company to come out and do it for you. You will see that when your building is accumulating mold and algae, it not only looks bad, but it can also be bad for your health and the health of all of your customers or renters as well. Mold spores can grow and eventually will break loose, blowing through the air and moving inside your home. These are dangerous for people with asthma or other breathing conditions and in some instances, have been known to cause certain forms of cancer. Don’t put your customers or renters at risk. Give us a call to get everything cleaned up. Here at Oliver Twist Pressure Washing, we are happy to help and put our customers and their happiness first in all aspects of what we do. We offer commercial pressure washing services to the Palm Beach Garden and Palm Beach County areas of Florida at affordable rates you will be happy with. 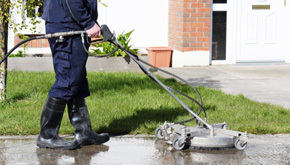 We are a team of highly trained professionals who have been working in the pressure washing business for many years. We have a 100% satisfaction guarantee for every job that we do. If you are not satisfied with the job, we will redo it to your specifications or refund all of your money. We are happy to clean your buildings as well as your parking lots for you. 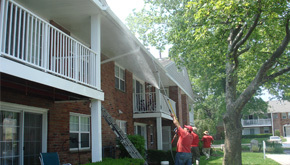 You will see that we use a combination of high pressure and soft pressure washing techniques to get everything clean. 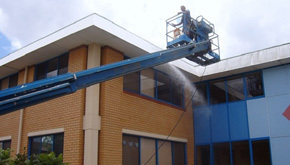 If you have ever been worried about damage getting done to your buildings, you have no need to worry because we here at Oliver Twist Pressure Cleaning will use a soft pressure wash on painted areas to avoid damaging paint. If you have a build up of mold, algae or other debris on your buildings, we will use a high quality cleaning solution combined with a high pressure spray to loosen it up, and follow it with a soft pressure spray to remove the loosened debris. You will see that we have all of the equipment necessary to get the job done quickly and effectively, including lifts, pressure washers and the solutions needed. We will be able to clean buildings, no matter how high they may be and we are also able to clean paved parking lots and even driveways. We will use our pressure washers to remove stains from pavement, concrete and get it looking like new again. We can also seal your paved parking lots and driveway the same day! Don’t wait. Give us a call today at Oliver Twist Pressure Washing so that we can come out and take a look at your situation. We will be more than happy to provide you with a free, no obligation quote so that you can see we are serious and want your business. We are happy to offer affordable and competitive rates, because we are the best in the business. If you choose to hire us, we are happy to offer you discounted rates if you choose to work with us for routine maintenance on your commercial property. We are proud to say that we are highly trained and licensed in the event that any damage occurs to your property. You will see that we will stand behind every job we do and that we will do anything to ensure your happiness with the job we perform. Give us a call today for your free quote!